Satellite images released on Wednesday revealed what appeared to be a satellite launch from Iran’s Imam Khomeini Space Center. The United States argues that such launches violate U.N. Security Council resolutions against Iran’s nuclear missile program. 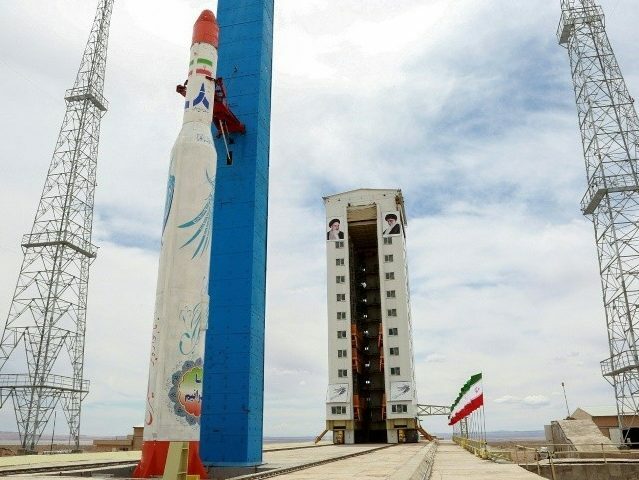 The Iranian government has not officially acknowledged the launch took place. The evidence for a satellite launch is almost comically straightforward: photos released by the DigitalGlobe company of Colorado showed a rocket sitting on the Imam Khomeini Space Center launch pad on Tuesday. When another series of satellite photos was taken on Wednesday, the rocket was gone and the launch pad was discolored with apparent scorch marks. “In the images, words written in Farsi in large characters on the launch pad appeared to say in part ‘40 years’ and ‘Iranian made,’ in different sections. That is likely in reference to the 40th anniversary of Iran’s Islamic Revolution, which authorities have been celebrating this month,” the Associated Press reported on Thursday. NPR quoted another satellite imaging company, San Francisco-based Planet, which saw the same signs of activity at the launch site and noted the same burn marks on the pad after the rocket disappeared.